TH E M R EP O RT | 55 O R I G I NAT I O N S E R V I C I N G DATA G O V E R N M E N T S E C O N DA R Y M A R K E T GOVERNMENT THE LATEST Castro Notes Accomplishments in Farewell Memo Lowering mortgage insurance premiums, increasing lending to responsible borrowers, and working with the DOJ to reach a monumental settlement with the nation's largest servicers were some of the accomplishments Castro highlighted. J ulián Castro is ending his run as the Secretary of the U.S. Department of Hous- ing and Urban Development (HUD) on a positive note, releasing a final memo to the American people that deems housing a "platform for oppor - tunity." The memo called attention to some of HUD's top housing-relat- ed accomplishments, including its efforts to stabilize the post-Great Recession market; help home- owners who lost their properties in Hurricane Sandy, floods, and other natural disasters; and give public housing residents access to high-speed internet through the ConnectHome program. "We stabilized a housing market in crisis and then," Castro said, "through the Federal Housing Administration, stepped up lending to responsible bor - rowers while increasing capital reserves and lowering mortgage insurance premiums. We devel- oped public-private partnerships to preserve affordable housing. We affirmed the Fair Housing Act's basic principle of desegre - gated communities and protected housing opportunities for all. And conscious of the damage climate change is wreaking on our homes and infrastructure, we invested more than $18 billion in communities recovering from natural disasters and initiated a $1 billion competition for resil - ient housing and infrastructure projects, and unlocked access to Property Accessed Clean Energy financing so that the thousands of American's that chose an FHA- backed mortgage each day can make energy efficiency improve - ments on their homes at no upfront cost." 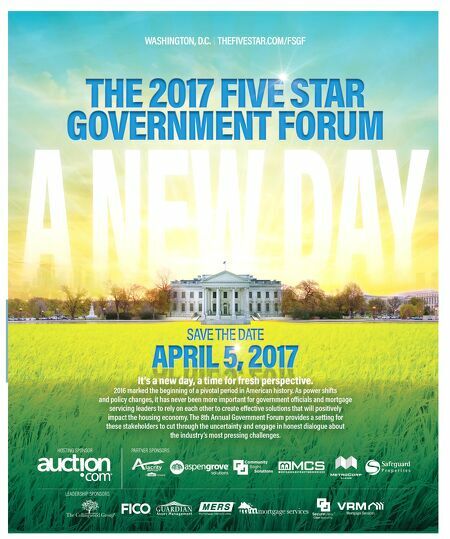 HUD also worked with the Department of Justice and 49 state attorneys general to protect homeowners from mortgage fraud during the financial crisis. The result was a $25 billion agreement in 2012 with the country's five largest lenders, providing relief to millions of homeowners across the country. It's these types of acts, along with many others, that make HUD the "Department of Opportunity," Castro said. "Everything we did in the last eight years was oriented to bring greater opportunity to the people we serve every day," he said. President Obama's administra- tion also has many things to be proud of, Castro said. "Through the Home Affordable Modification Program (HAMP), Home Affordable Refinance Program (HARP), the Hardest- Hit Fund, and the Neighborhood Stabilization Program (NSP), the Obama Administration's efforts stabilized the economy by providing a critical lifeline to more than 10 million distressed homeowners," Castro said. "These efforts paid off—Americans built nearly $7 trillion in housing wealth since 2009. Today, home values in many housing markets are fully recovered, and more people are once again turning to homeownership to build equity for themselves and their families." But despite the many things that have been accomplished over President Obama's eight and Castro's nearly three years in office, Castro said there is still work to be done. "Much has been accom - plished during the Obama Administration, but new chal- lenges are on the horizon, including a severely aging public housing stock and an affordable housing crisis in many areas of the country," Castro said. "Just as HUD provided necessary rein - forcement to the housing market during the latest economic crisis, this vital Department will be crucial to the continued improve- ment of the American economy and the security of millions of Americans in the years to come." 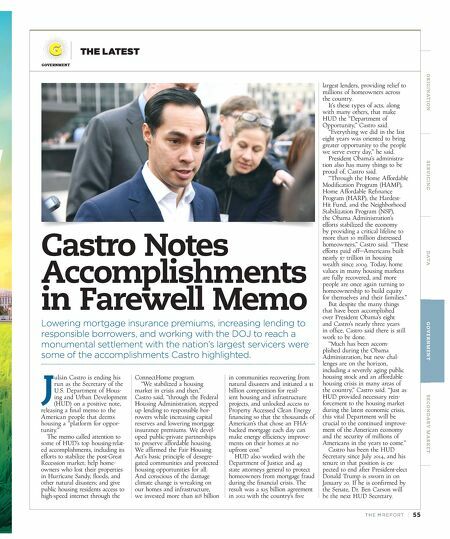 Castro has been the HUD Secretary since July 2014, and his tenure in that position is ex - pected to end after President-elect Donald Trump is sworn in on January 20. If he is confirmed by the Senate, Dr. Ben Carson will be the next HUD Secretary.